The Karate Nerd eXperience 2015 (KNX15) is a Karatecamp with a goal of bringing Karate fiscally, technically and theoretically to a higher level. 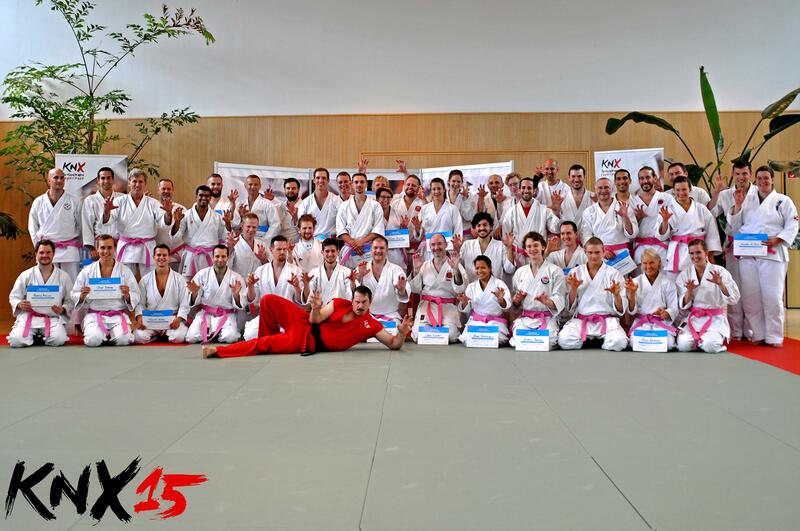 The recipe consists of four teachers, special activities, a “secret Sensei” and 38 Karate Nerds from 18 countries. Everyone is equal, no matter what the experience, age or rank is. That’s why the pink obi is used, like it should be at the classes at Nerd level. The classes were challenging and the questions “how and why?” were very important. 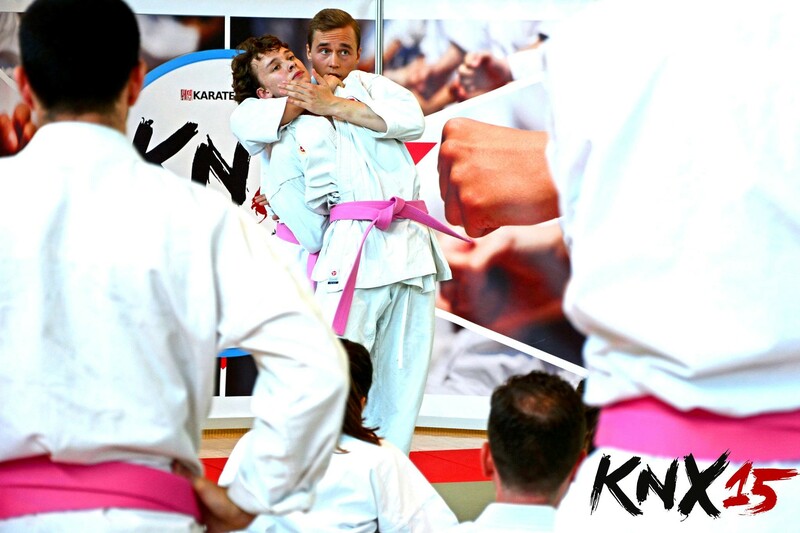 The KNX event is widely-known, because of the fact that it positively changes you and your Martial Arts. Experiencing this fantastic combination kept me thinking about the Japanese word “Ryomi”. The Japanese word “Ryomi” represents the process of critical self-evaluation. There must be continuous personal growth and perfection through study and practice. At the start of KNX15, the rule is that classes should be attended with an “open mind”. This is the reason that the classes contain the best technical and theoretical content with the option to interact with the group and the teacher. The question “why?” needs to be kept in mind at all times. The training and use of Martial Arts is: applying physically knowledge with theoretic principles to create routine and perfection. The classes of sensei Hokama Tetsuhiro (10th dan Japan, Okinawa), Jonathan Horne (World & European Kumite Champion), Jesse Enkamp (KaratebyJesse) and Waldo Zapata (BJJ & MMA Pioneer), showed the equal and different aspects of Traditional Karate, Sport Karate and MMA/BBJ. Sensei Hokama taught Karate as Martial Art with the aspects of control, misbalance and pain. Waldo Zapata created the bridge between the principles of Karate and BJJ by using the same principles from the groundwork of MMA and BJJ. The difference between traditional Karate and Sport-Karate is big. The class of Jonathan Horne was based on the principle to win based on points. There hasn’t been any event that made the feeling of Ryomi so strong; KNX is a lifetime experience. Karate is “a way of life” whereby Ryomi is very important. The use of technical and theoretical principles is necessary in order to reach your Martial Arts goal. The most important thing is always to learn, always show your respect and forget your Ego.